Ohsweken, Ontario – December 20, 2012 – Ohsweken Speedway will be holding rules and registration meetings for all four of the track’s weekly Friday Night Thunder divisions on Sunday, January 27, 2013 at the Best Western Brant Park Inn located in Brantford, Ontario. 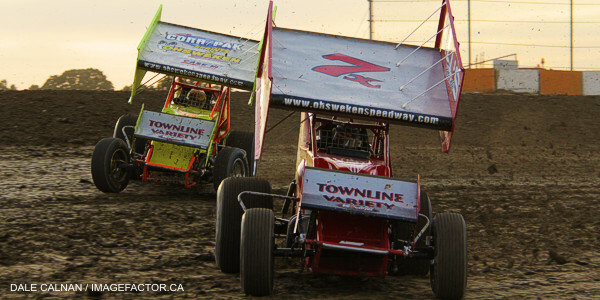 Schedules and other plans for the 2013 Ohsweken Speedway season are well underway, with the World of Outlaws Sprint Car series already confirmed to return to Ohsweken on Tuesday, July 30, 2013. The entire 2013 Ohsweken Speedway schedule will be officially released early in the new year. About Ohsweken Speedway: Founded in 1996, Ohsweken Speedway is a 3/8 (0.375) mile clay oval owned by the Styres family, and located in the village of Ohsweken, Ontario, Canada. Ohsweken’s weekly Friday Night Thunder program runs from May to September, featuring Corr/Pak Merchandising Sprint Cars, Thunder Stocks, HRW Automotive Mini Stocks, and Bombers, while the season finishes each year with the annual Canadian Sprint Car Nationals. Ohsweken Speedway has also been a yearly stop on the World of Outlaws Sprint Car series schedule since 2007.